First time outside to play! 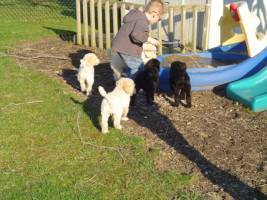 Our puppies are kid tested! Lexie is now a New Yorker. 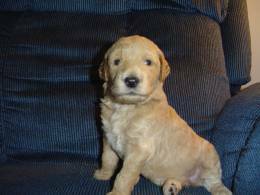 Charlie lives in northwest Ohio and will be traveling extensively! 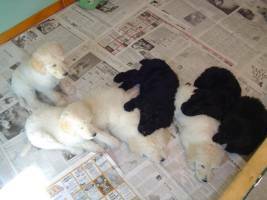 Interested in a Standard Poodle? 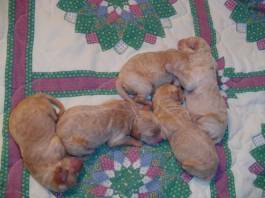 They are a very versatile breed of dog. They love to be with their person, lying quietly next to you, taking long walks, swimming, playing fetch, or working in obedience or search and rescue, agility, and hunting. 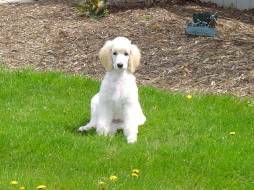 First, take everything you know about your gramma's little poodle and forget it!! This is not your gramma's poodle! Standards are a highly intelligent dog, but they are not "yappy" or "hyper". They love their family, but most are wary of strangers until they accept them. They make excellent "watch" dogs with their size and warning bark. They are so intelligent, that to correct your standard all that is needed is a change in the pitch of your voice. They know they have done wrong when they hear the change! I recommend all my puppies attend a puppy kindergarten class at the least. This gives them and YOU the basics for obedience. 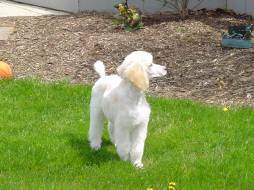 The beauty of owning a poodle is that you can have them trimmed in any style that you like. 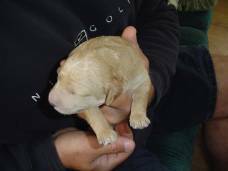 No dog, with the exception of the hairless breeds, is completely non-shedding. 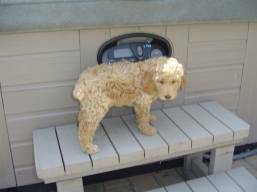 This is a myth; poodles do shed but only to a small degree. This hair gets caught up in the haircoat of the dog itself, therefore you don't find it throughout the house. This is why it is important to brush your poodle on a regular basis. Otherwise, the shedding hairballs will cause a matt. 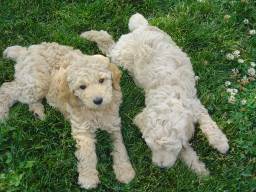 As a rule, poodles get along wonderfully with children and other pets as long as each are raised to respect the other. Some tend to have a high prey drive depending on the lines which they are bred from. Ours have been raised on a farm with children and small animals, and we have never had a problem--even with free-roaming chickens! 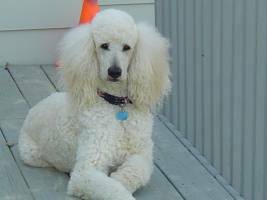 We feel the poodle is the perfect breed, but it is not for everyone. Do your research and make the proper decision--one that will last a lifetime. 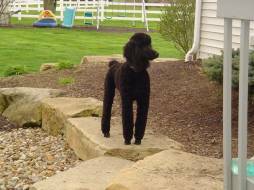 Are you ready for an O'Kaylyn Farms Standard Poodle? Do you have time for a dog? 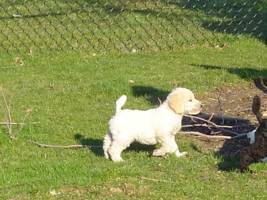 Who will be in charge of the puppy? Do you own your own home? Do you have other pets? How will they react? 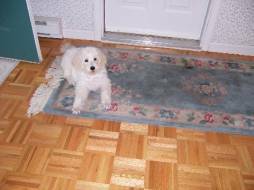 Have you ever owned a dog before? 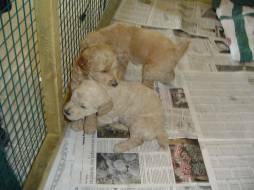 Are you willing to give proper veterinary care for your puppy throughout its life? 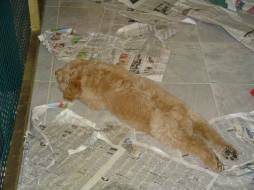 Are you willing to give a dog the proper diet and exercise it needs? 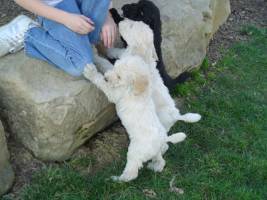 The proper socialization a young puppy needs? 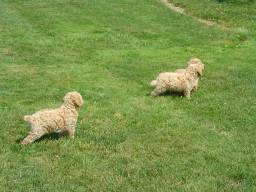 The proper training--puppy classes/obedience classes? Every dog benefits from these. 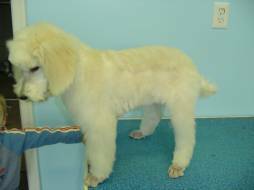 Poodles of any size require regular grooming, the size of a standard makes grooming costs more expensive. Are you willing to commit to a REGULAR grooming schedule with a professional groomer or learn to groom yourself? Are you willing to brush this dog on a regular basis? 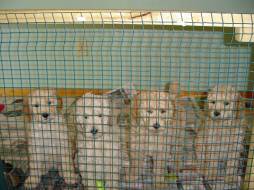 Remember a matted dog is a neglected dog! My contract is a legally binding agreement. 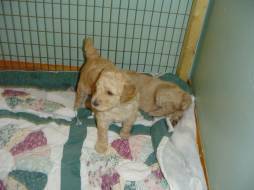 Along with the spay/neuter agreement, you must also agree to never place this dog in a rescue or pound situation. The dog must be returned to me if this should come about. Are you willing to agree to this? In return, I agree to guarantee the health of this puppy. 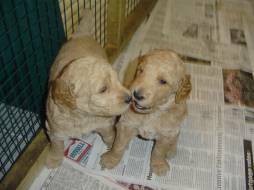 These are things that need to be decided before you decide on a new puppy of any kind. A dog is a commitment of 12-14 years or more.